# Awarded DELL EMC Centre of Excellence Certificate during Bridge 2018. # Best Institutional Award by Institution of Engineers (India), Tamil Nadu. # Best Cyber Security Education Institution Award of the Year 2017 by Data Security Council of India (DSCI) – NASSCOM Excellence Awards. # Best Accredited Student Branch Award from Computer Society of India. # The School of Architecture, HITS won the Conventional Trophy in ZONASA 2017 (Zone 6) on 10th November 2017. # State-of-the-art (CENCON) Clean Energy and Nano Convergence Research facility was inaugurated by His Excellency Dr A.P.J.Abdul Kalam, former President of India. # Hindustan Institute of Technology and Science is the only institution with a Boeing 737 Aircraft Simulator and Airframe & ALSIM AL 50 Glass Cockpit Simulator. # In the Research Area, the institution obtained US$ 3 Million for aviation project from Department of Science & Technology, Govt. of India (TIFAC-CORE). # Hindustan Institute of Technology and Science has Hawker Beechjet 400 to offer training to the students in Aircraft Maintenance. # Students have been placed in reputed firms such as Deloitte, Infosys, L&T InfoTech, Capgemini, Ramco Systems, Mahindra & Mahindra, HCL Technologies, Ernst & Young, Honeywell, CDG Boeing, USA to name a few. # The University has constructed state of the art lecture theatre called the “Andromeda Lecture Theatre” with a seating capacity of 500. The lecture theatre was designed by Architect Mr Ajay Kora. # Vikramaditya Joins Hindustan: This ship is an aircraft carrier purchased by India from the Soviet Union at a cost of $2.35 Billion. Admiral Gorshov was renamed as INS Vikramaditya in honour of the Legendary 1st Century B.C. Emperor of Ujjain, famed for his wisdom, valour, and magnanimity. Hindustan University – ample opportunities are provided for research-minded students to hone their research skills. The purpose of the research is to ask questions and solve problems. This institution has an exceptional resource, with unique capabilities. The knowledge that is generated in the University is being applied to real-world problems every day. By combining cutting-edge research with graduate and undergraduate education, research university is also training the next generation of leaders. The research scholars participate actively in pioneering research studies through Ph. D., M. S. (by research) and M. Phil. programs. The faculty of Engineering, Science, Humanities and Management conduct research do active research in emerging areas, which often results in highly acclaimed publications in International and National journals and patents. Most of the research work is also presented in International and National Conferences. The Department of Science & Technology, Aeronautical Research & Development Board, Indian Space Research Organisation, Ministry of Non-Conventional Energy Resources and Defence Research & Development Organisation, Naval Research Board, Department of Electronics, IGCAR, Atomic energy agencies and other organizations support the institution either giving funds for research projects or providing technical support for tackling the challenging research issues of national interest. The faculty also undertakes several application-oriented industrial consultancy projects with industries in India and abroad and collaborative research projects with foreign universities. Opportunities are available for interested students to participate in such sponsored research, industrial consultancy or collaborative research projects. The Engineering, Science, Humanities and Management Departments of our Institute is equipped with excellent laboratories, facilities with state-of-the-art equipment. Research works are carried out in the interdisciplinary areas among the Departments which may be pursued by the research scholars for the Ph. D. degree. Chennai – 600 016. India. 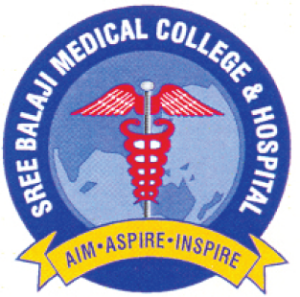 Shri Sathya Sai Medical College and Research Institute (SSSMCRI), Chennai, 2019 admissions started. This college comes under the ambit of Sri Balaji Vidyapeeth University, enjoying the prestigious Deemed University Status as the legendary parent institution, Mahatma Gandhi Medical College and Research Institute, Puducherry. The college is approved by the Medical Council of India, New Delhi & Govt. 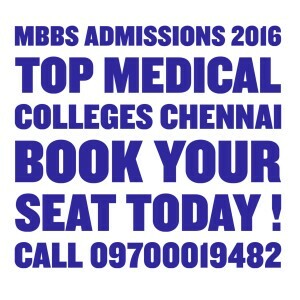 of Tamilnadu for conducting MBBS course.The college strives to provide a professionally focused educational system, with fresh approaches to courses, introducing new ways to motivate their learners, make use of novel learning styles, introduce multiple intelligences, embracing global trends and ideas and to put it in a nutshell, making the art of teaching more exhilarating, enthusiastic and effective. A notification has been issued by Sri Balaji Vidyapeeth Deemed University regarding to conduct Common Entrance Exam test for providing admission into various medical course like MBBS / BDS / Nursing and Diploma Courses. The candidates who are interested to take admission into MBBS/ BDS courses for the academic session 2017-18 under this University can apply for the CET 2017. Application are invited via onlne mode from eligible candidates. Sree Balaji Medical College Mbbs Admissions 2017 Started From Jan 2017. 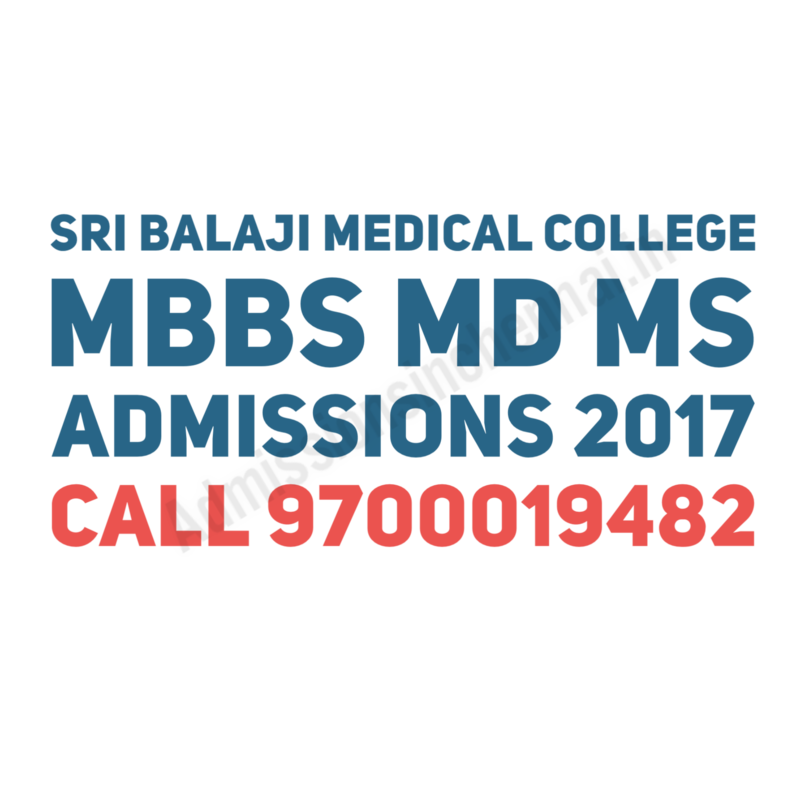 For Advance Booking and to know more about Sree Balaji Medical College Mbbs Fees structure 2017 Call 09700019482. 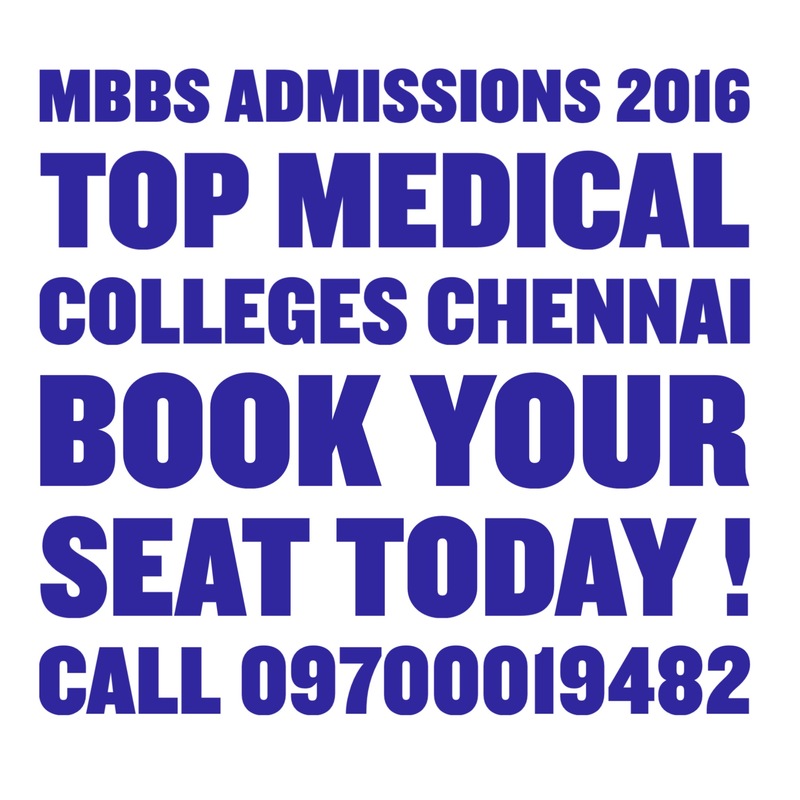 Mahatma Gandhi Medical College Mbbs Admissions 2017 Started From Jan 2017. Interested Students with eligibility criteria can reserve their Admission in Advance.Mahatma Gandhi Medical College Mbbs Fees Structure 2017 Call 09700019482. 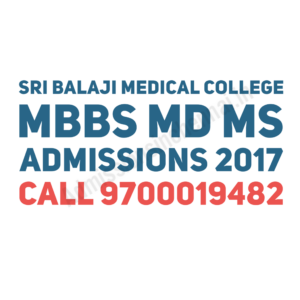 Mahatma Gandhi Medical College and Research Institute (MGMCRI), 2017 Admissions Started.Pondicherry is a leading medical institution under affiliation to Sri Balaji Vidyapeeth. 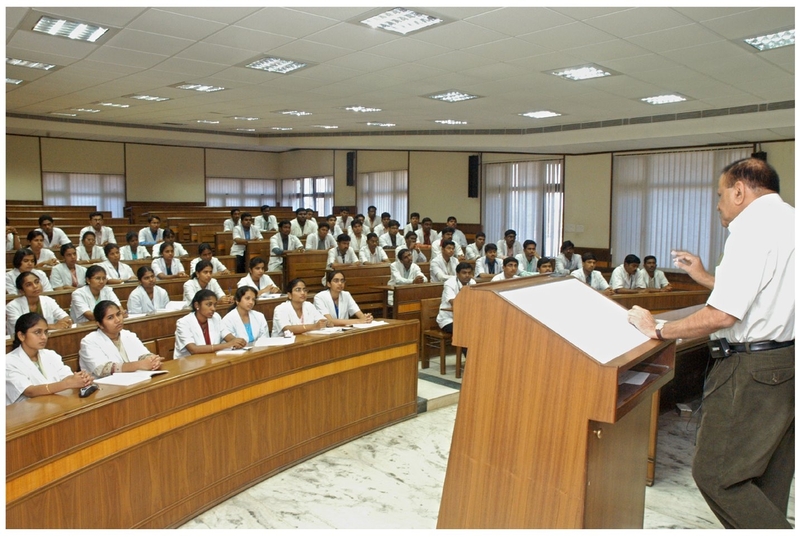 It is a Deemed University that offers an amicable and academically challenging environment with an excellent reputation for teaching quality, state-of-the-art study and treatment facilities by it supportive staff. Institution serves a highly unique and culturally diverse student body and upholds excellent quality standards, academic advancement and personal growth among its students. It has been recognized by Medical Council of India, Ministry of Health & Family Welfare, Government of India, New Delhi and the Government of Puducherry for conducting under-graduate and post-graduate Medical courses. Mahatma Gandhi Medical College and Research Institute stands strikingly as an architectural beauty, with its massive structures on the east coast road, at Pillaiyarkuppam, between Puducherry and Cuddalore. Strategically located on the NH-45A National Highway, very close to Cuddalore town and 14 kms from Puducherry, it provides a gamut of medical services to the numerous urban and rural public in the surroundings. Puducherry, now an educational hub, tracing its past to the French culture and architecture, breathtaking backwater scapes, colorful shopping arcades. streets, beach promenade for a nice stroll and sea breeze, gastronomic delights, wealth of tourist sites viz., Auroville, Aurobindo Ashram, Manakkula Vinayakar Temple, attract more number of tourists than any other city in south India. A visionary and trend-setter Shri. M. K. Rajagopalan, Chairman is the founder and innovator who loves challenging tasks. He believes that a vision backed with a strong commitment and dedicated efforts can make things happen, transform lives and change the world we live in. His pioneering venture in the Union Territory of Pondicherry introduced 6 colleges, setting a dynamic trend in the field of professional education. His endeavors paved the way for others to follow him and today Puducherry boasts more number of professional colleges than any other State for its area and population. His unquenched zeal for educational promotion brought a boon to Chennai too, one more milestone with the birth of SSSMC&RI in 2008. The Institution is headed by Professor KR Sethuraman. MD, PGDHE., Vice-Chancellor, Balaji Vidyapeeth University. Mahatma Gandhi Medical College and Research Institute, is proud to have been recognized for its successes, achieving the highest possible Deemed University status conferred by University Grants Commission, New Delhi, embracing the domain Sri Balaji Vidyapeeth University. Mahatma Gandhi Medical College and Research Institute has been enlisted in the most referred FAIMER International Medical Education Directory published by Foundation for Advancement of International Medical Education and Research, USA. 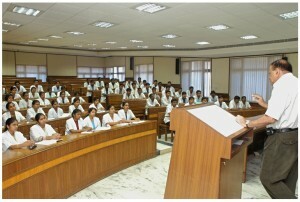 Patient Services, Adult and Paediatric patient care – Each year, Mahatma Gandhi Medical College & Hospital treats more than 4,60,000 adults and children patients, with its highly professional and dedicated team of physicians, surgeons, nurses, assistants, and fully equipped and well maintained departments. The out-patient services daily handles approximately 1300 patients on an average. Housing a 750 in-patient beds, the general wards are spacious, adequately ventilated and illuminated with an occupancy rate presently at about 85%. The hospital provides casualty and emergency medical services round the clock, along with fully-equipped ambulance service. A 24-hours blood bank is in a state of readiness to develop into a full-fledged department of transfusion medicine. Varieties of minor and major surgical procedures are performed in 10 state-of-the-art OTs. Closed-circuit televisions are provided for medical students to view various operative procedures from outside the operation theatres. Our intensive care units are equipped with essential critical care equipments and cater to the special needs of critically ill patients. The hospital is endowed with advanced equipment such as Cath Lab, spiral CT, MRI, fully automated random access blood chemistry analyzer, chemiluminescence analyzer, treadmill, computerized RCG, and a flexible fibreoptic bronchoscopy unit. Haemodialysis, neonatal ventilators, PUVA photochemotherapy, biofeedback, and sinus endoscopy procedures are part of our therapeutic armamentarium. Our Hospital houses a well infrastructured and fully air-conditioned Master Health Check Up Centre for optimum Patient Care, offering range of incredibly affordable packages covering routine Blood & Urine Tests, E.C.G, X-Ray, Treadmill, Pulmonary Function Test, Ultra sonography with Colour Doppler along with the latest imported CT Scan and MRI facilities. Our qualified and well trained technicians handle each case meticulously to give the most reliable reports. All academic activities of the faculty members are co-ordinated by the Scientific and Academic Forum of MGMCRI. This forum organizes scientific meetings once a month. Biomedical research receives high priority at MGMCRl. Our institution liaison with governmental and non-governmental organizations for research grants. All research activities are supported and co-ordinated by the Research Committee of MGMCRl. The administration has regular liaision with the parents of the students with regard to the well-being of their wards. Excellent arrangements for food, accommodation, transport, communication and banking make MGMCRI a “home away from home” for our students. The MGMCRI campus offers separate hostels for men and women. These hostels are located in a serene environment, close to the college and hospital blocks. The rooms are comfortable, spacious, air-conditioned and well-ventilated. Exclusive hostel wardens oversee the well-being of the students. Our institute has its own fleet of buses for safe and quick transport of the students and staff. Students have access to a full-fledged gymnasium.